Croft Freshmen, Samuel Starr and Hayden Williamson, were both awarded the Doris Raymond Honors Scholarship this fall. 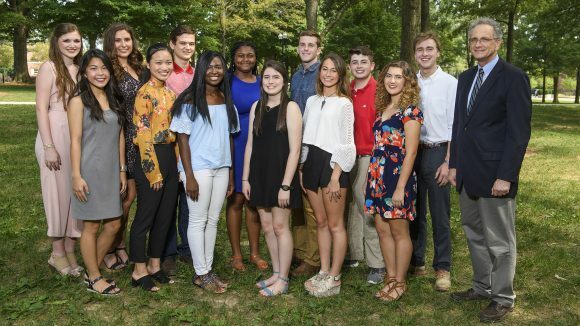 They are two of the 14 Freshmen Scholars in the University of Mississippi's Sally McDonnell Barksdale Honors College who received one of the university's most prestigious scholarships, totaling $434,000 in scholarships. Samuel Starr, who is focusing on Spanish, recently began his undergraduate degree in International Studies. From Troy, Illinois, Sam was an Illinois State Scholar and highly involved in Student Government, the National Honor Society, and Madison County Youth Board. Sam participated in Model United Nations as well and won several awards at the University of McKendree Model United Nations. Hayden Williamson, who is focusing on Spanish in Europe in International Studies, is a from Ocean Springs High School. Hayden was president of the Ocean Springs Mayor's Youth Council, co-founder and secretary of the OSHA Debate Club, committee chair at the Mississippi Youth and Government's Youth Legislature and chief justice at the Model UN. A member of the 30+ ACT Club, Hayden was on the principal's list, in the National Honor Society, American Legion Auxiliary's Magnolia Girls State and Palazzo Youth Leadership Summit.